Dodgers Blue Heaven: Welcome to the Blue, Ian Thomas! Welcome to the Blue, Ian Thomas! The Los Angeles Dodgers today recalled left-hander Ian Thomas (#58) from Triple-A Oklahoma City to be the 26th man for today’s doubleheader at Colorado. Thomas, 28, was acquired as part of a six-player trade with Atlanta last week and has gone 1-2 with a 3.94 ERA in 21 Major League appearances with the Braves in 2014-15, including allowing three runs (two earned) in five appearances this year (5.1 IP). He last pitched on Thursday (2.1 IP) and has combined to go 1-0 with a 3.00 ERA, a .200 opponents’ batting average and a 0.83 WHIP in 10 minor league appearances this year with Oklahoma City and the Braves’ Triple-A Gwinnett and Double-A Mississippi. He’s a lefty, but not a hard thrower, topping out at around 90 mph. He creates a ton of deception with a similar motion on all his pitches, and his plus off-speed change and curve clock in around 20 mph less than his fastball, making it tough for batters to distinguish between his pitches. He was equally effective last year against lefties and righties, holding each to an identical .192 BAA. In celebration of Thomas' arrival to the Dodgers I made the above fantasy card for him. 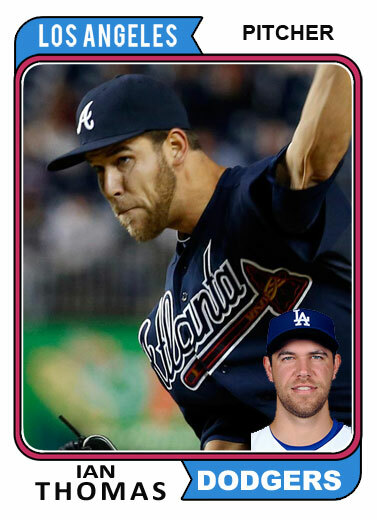 I used a photograph grabbed from the Braves.mlb page and the 1974 Topps Baseball card design.